Pittsburgh is one of America’s Most Livable Cities – and a photogenic marvel as well, thanks to picturesque landscapes, rolling woodland valleys and idyllic riverside scenery. You and your spouse will find an abundant array of memorable wedding picture spots. Perhaps best of all, the Steel City has relatively compact city limits – your photography session can contain multiple locales if one area simply won’t do. Whether you’re looking for a distinct urban vibe, natural scenery or a mix of both, Pittsburgh is a picture lover’s dream! With 446 bridges, Pittsburgh offers an unparalleled range of spans, crossings and walkways. The city’s West End Bridge is perfectly situated at the Allegheny, Monongahela and Ohio River confluence. This iconic structure serves as an ideal foreground for Pittsburgh’s “Golden Triangle” downtown area. 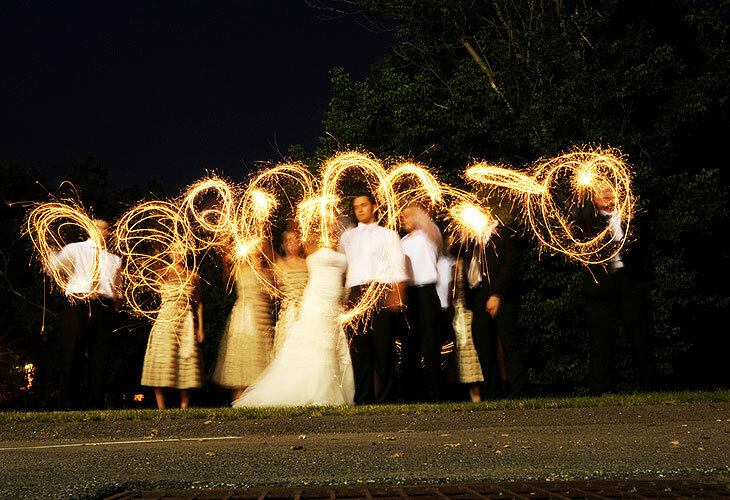 You’ll want to take plenty of wedding pictures at the West End Overlook. Your photo shoot can encapsulate the West End Bridge, downtown and all three rivers atop the overlook’s observation deck. Even at ground level, you’ll enjoy a depth & scope of Pittsburgh rarely achieved anywhere else in the city. All of Pittsburgh’s landmark structures – Heinz Field, PNC Park, the US Steel Building, PPG Place and more – offer stunning scenery for your wedding picture album. And unlike other major metropolitan areas, the ‘Burgh has those trademark river valleys dotted with hillside neighborhoods, inclines and much more. The West End Overlook is actually one such spot, nestled in Pittsburgh’s West End and Elliott neighborhoods. One glance from this overlook explains why it’s such a highly coveted spot for newlywed photography. You’ll be glad your snapshot session stopped at this easily accessible section of the city. Another classic spot is outside the Mellon Institute in the Steel City’s Oakland neighborhood. Located across St. Paul Cathedral on 5th Avenue, it has remained a go-to newlywed photography spot for generations. This neo-Classical structure has the largest monolith limestone columns in the world – sixteen in all! Have your photographer snap some shots directly perpendicular from this magnificent structure. For unparalleled depth, you can take pictures from one end of the Mellon Institute, with the other tapered away toward the horizon. Black and white photography also works well at this spot, thanks to this building’s classic lines and refined craftsmanship. While you’re here, why not cross the street and get some pictures by Pittsburgh’s well-known St. Paul Cathedral? Built in Scholastic Gothic style, its soaring spires and crisp lines complement the nearby University of Pittsburgh campus. This impressive church is over 100 years old and makes a beautiful backdrop from a variety of vantage points. Again, a black and white photography color scheme is ideal for capturing the essence and scope of St. Paul Cathedral – and the significance of your own special day, of course! Late spring and summer weddings should find minimal crowds for picture sessions near the Mellon Institute and St. Paul Cathedral. However, when classes resume at the University of Pittsburgh, student life springs to life and you may have issues with crowds & traffic. If your wedding is scheduled during normal class hours, it’s best to shoot your photos in the early evening, when Fifth Avenue foot traffic lessens a bit and you’re free to pick preferred vantage points. 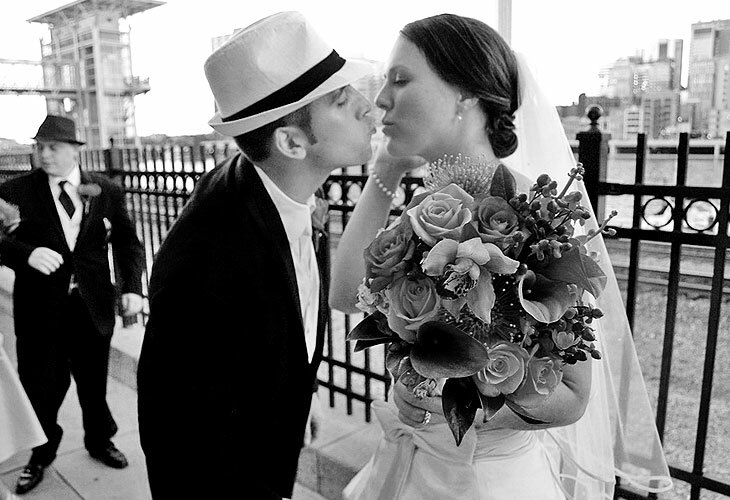 Pittsburgh’s Station Square and the adjacent Smithfield Street Bridge also rank as prime wedding picture locales. The Station Square area includes a wide riverfront expanse of shops & restaurants, along with a spacious walkway with benches and an excellent view of downtown across the Monongahela River. An early evening picture taking session should include the Fountain at Bessemer Court. This large fountain has a multicolor medley of water jets that shoot upwards of 40 feet high. Station Square’s promenade has picture-worthy backdrops that express Pittsburgh’s heavy industrial past. One such locale is the former Pittsburgh & Lake Erie Railroad terminal anchors the eastern edge of Station Square. This historic structure has been converted into a fine restaurant called the Grand Concourse. If you’re looking for unmatched interior photography, try to gain access for a shot on the restaurant’s towering stairwell. The restaurant’s vaulted glass ceiling offers soft, subdued light for unforgettable wedding snapshots. Be sure to call ahead and make reservations is necessary; the Grand Concourse has a menu that matches its sweeping beauty, so it’s usually busy. Back outside, you can complete your wedding photo itinerary with some shots of the Smithfield Street Bridge. This National Historic Landmark has served as an essential element of Pittsburgh wedding shots for over 125 years. It remains the oldest steel bridge in the United States, yet always brings a fresh & new perspective to any nuptial celebration – including yours!